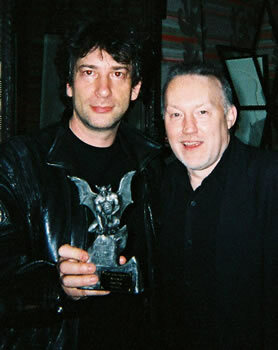 No sooner was I back from World Fantasy Convention than Neil Gaiman called. He was in London to promote the release of BEOWULF (which he co-scripted), and decided to celebrate his 47th birthday on November 10th with a private party for friends and colleagues at his hotel. Around sixty people turned up to enjoy the copious champagne and finger-food, and I took the opportunity to present Neil with his recent British Fantasy Award for Best Collection (FRAGILE THINGS). editor STEPHEN JONES who will be hosting a Q&A discussion about modern horror fiction and discussing some favourite authors and their works. COPIES OF THE BOOK WILL BE ON SALE! 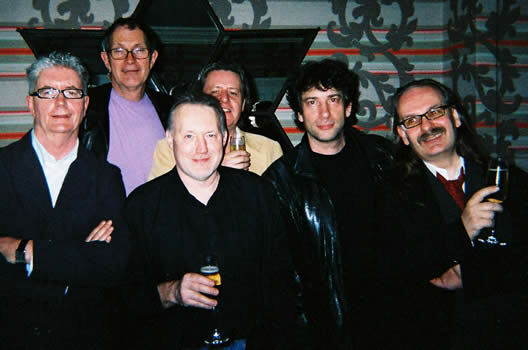 Although I attended the very first British Fantasy Convention in 1975, and have been at almost all the gatherings since then, FantasyCon 2007 was the first time I had ever been a Guest of Honour. It was a wonderful experience, and I would like to thank the organisers and everyone who attended for the many kindnesses shown to me over the weekend in Nottingham. 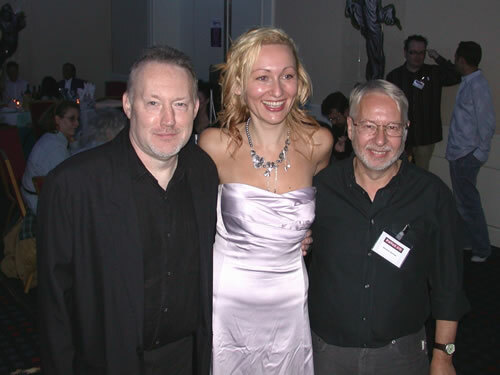 What helped make it such fun was that along with multi-million copy selling fantasy author Terry Brooks, my fellow GoH was old friend and collaborator Michael Marshall Smith, while the incomparable Peter Crowther made an exuberant Master of Ceremonies. For me, things officially kicked off at 7:00pm on the Thursday with a "Welcome to FantasyCon" introduction in the bar, swiftly followed by an oddly low-key "Mass Signing". Terry Brooks was undoubtedly the star of this event, but some of us signed a fair few books as well. Then it was off to dinner with Val and Les Edwards, Jo Fletcher and Amanda Foubister, followed by drinks in the bar. 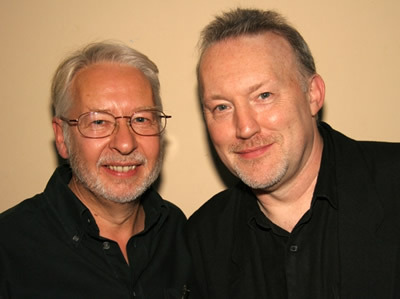 Saturday began with me interviewing Ramsey Campbell off camera about literary vampires for a forthcoming Doctor Who DVD, then at mid-day I was on a lively panel about the "Trials and Tribulations of Publishing from an Editorial Perspective". I was a little unsure about why I was on this item, but thanks to moderator Andrew Porter and fellow panellists Peter Crowther, Jo Fletcher and George Mann we easily filled our forty-five minute slot and could have kept the discussion going for quite a while longer. However, I had to get back to the bar for a pre-publication signing for The Mammoth Book of Best New Horror Volume Eighteen, organised by independent bookseller The Talking Dead (thanks, Bob). As it turned out, they sold all thirty copies they had within six minutes and, for the next hour, myself and contributors Ramsey Campbell, Joel Lane, Mark Morris, Mark Samuels and cover artist Les Edwards signed for a seemingly never-ending line of horror fans. 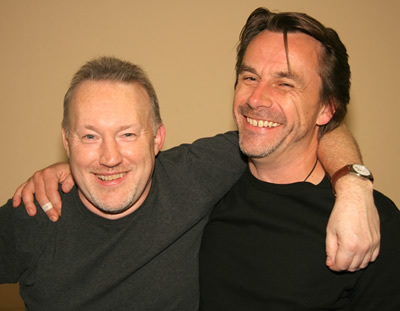 Following a hurried M&S sandwich (thanks, Mandy) and a few welcome beers, I was back on stage at 4:00pm for a "Conversation" between Mike and myself. We weren"t entirely sure how this would work out, but the audience seemed to enjoy our free-flowing discussion, and Mike and I certainly enjoyed the free-flowing single malt (thanks, Paul) that we consumed during the seemingly all-too-short hour-and-a-half. After a fabulous Orion Books dinner (thanks, Jo) with many of the usual subjects and old friend Simon R. Green, Mike, Jo and I were back on stage at 9:30pm to host the "Fabulous FantasyCon Raffle". This year the organisers had allowed two hours and, although I didn"t expect us to need all that time, we had such a wonderful selection of prizes donated that we used our full allotted slot and raised around £1,000 to put some lucky person chosen by the British Fantasy Society through a respected writing workshop programme. But the evening wasn"t over for Mike and me yet. Next we headed upstairs to a packed Film Show where, for the next hour, we previewed test footage and animated storyboards from MonsterMania! – a cartoon for children that we have scripted. Thankfully, the audience seemed to laugh in all the right places. Exhausted, we finally made it down to the hotel bar around 1:00am, where some of us stayed up later than others . . .
At least Sunday was a little more relaxing, although a lively and positive BFS AGM took up most of the morning before I headed down to the main suite to help organise and decorate the room for the Awards Banquet. This year quite a number of people made the effort to dress up for the event, and although the meal was (as usual for these types of things) barely edible, and I don"t remember much about my (hopefully brief) speech, the subsequent Awards Ceremony went like a dream thanks to the hard work of David Sutton, Jen and Pat Barber, and everyone else who put their time and energy into making the afternoon's festivities so enjoyable. Once again I lost out on a British Fantasy Award, but Gary Couzens was a deserving winner in my category, and I did get to accept Neil Gaiman's award for Best Collection. However, all too soon it was a blur of goodbyes, more drinking in the bar and a late dinner with another group of friends (both old and new). For me, personally, the weekend could not have gone better (despite still recovering from a broken ankle and having the Largest Kidney Stone in the World). Although I didn"t get to hang out with everyone I wanted to, I did have the opportunity to talk with quite a number of people (including several newcomers to the convention), and I even managed to get around the Dealers" Room and Art Show at least once. The final attendance for the convention was apparently around 330, and I hope the BFS can continue to build upon that figure next year when the event once again returns to Nottingham. I"ll be there—albeit in the audience, while some other lucky person has all the fun being a guest! THEY'RE RUSSIAN TO BUY "VAMPIRES"
July 2007: Stephen Jones has just had his first Russian translation published. The Azbooka-klassika publishing house in St. Petersburg has issued the revised 2004 edition of the best-selling THE MAMMOTH BOOK OF VAMPIRES as a beautiful 900-page hardcover. The hefty volume includes all thirty-five stories from the original Robinson/Carroll & Graf edition and, for those who are interested in such things, the author names listed on the cover in Cyrillic are (in order) Clive Barker, Robert Bloch, Neil Gaiman, Tanith Lee and Christopher Fowler. Many of Stephen Jones's previous books have been translated into Italian, Spanish, French, Czechoslovakian and Japanese. 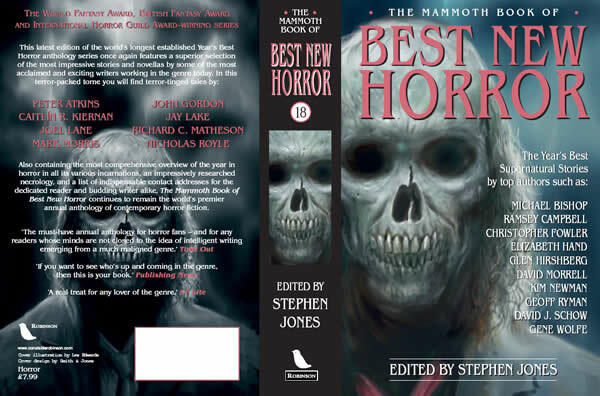 Editor Stephen Jones has delivered THE MAMMOTH BOOK OF BEST NEW HORROR VOLUME EIGHTEEN to Robinson Publishing in the UK and Carroll & Graf in the US for publication in autumn 2007. This latest edition of the world's longest established Year's Best Horror anthology series once again features a superior selection of the most impressive stories and novellas by some of the most acclaimed and exciting writers working in the genre today. As usual, it also contains the most comprehensive overview of the year in horror in all its various incarnations, an impressively researched Necrology, and a list of indispensable contact addresses for the dedicated reader and budding writer alike. THE MAMMOTH BOOK OF BEST NEW HORROR continues to remain the world's premier annual anthology of contemporary horror fiction. 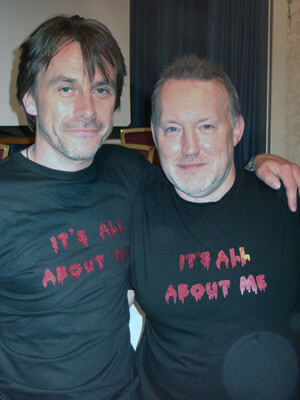 Stephen Jones is now looking for stories copyrighted 2007 and first published between December 2006 and December 2007 for THE MAMMOTH BOOK OF BEST NEW HORROR VOLUME NINETEEN. The deadline for submissions is February 1st, 2008. Please remember that this is a REPRINT HORROR anthology, so please do not waste the editor's time with any work that does not fit into that category. Also, if you have published a horror or dark fantasy novel, collection, anthology, reference book, magazine or fanzine in 2007 that you think may be suitable for the editor's annual overview of the year in horror, please send it to the same address and it will receive a mention if appropriate.